When the field of 156 players hit the links on Thursday for the Open Championship for the first round they might have thought they were on the coast of Florida. Curtis drives from the first tee unaware of the nightmare that awaits. Come Friday and they definitely know they are in the heartland of links golf in Scotland as the weather is combining with the course to ruin plenty of dreams of holding the Claret Jug come Sunday. It’s blustery here but not too cold and the first 10 holes are proving a real nightmare for everyone as they head out straight into the breeze. We are going to see some erratic scoring today. America's Ben Curtis is the best example so far of the course biting back. He was one shot off the lead yesterday on 5 under but, after an opening nine that came from the book of golf's worst nightmares with seven over par holes, today will post a 10 over 80 and may very well miss the cut. 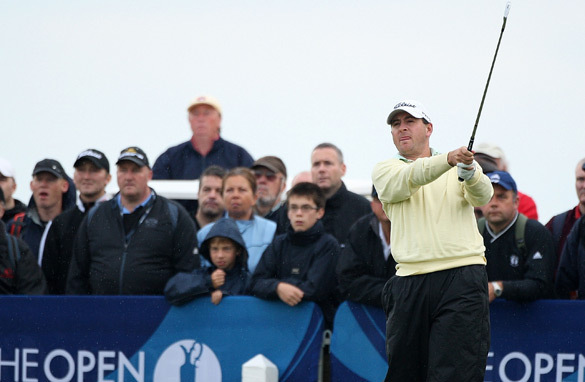 On the other hand American Steve Marino managed a 2 under 68 after heading out early for a tournament total of 5 under and will comfortably take part over the final two days of the Open. Not only will there be plenty of interest in how the field copes with the conditions but Tom Watson will have a huge following. The 59-year-old will need all his experience today if he is going to manufacture anything like Thursday’s sparkling round of golf. In all it should be a fantastic day of golf to watch.